Today light pollution or poor weather makes it hard to capture images of the universe. Many people rent telescopes at an hourly rate, but we took the simple approach. We offer low cost telescope rental where you can log in to the site and use the telescope for the entire night at $99. If you want a second consecutive night as well, then your total cost is only $175. If you have never imaged before and want to learn how it all works, we can set up a training session at no extra charge. If clouds move in during the night, then you will be able to continue another night. If any equipment issues come up, you have the choice to reschedule for another night or get a refund. We have a library of calibration files; however, if you need something different, we can take those for you and send you a link. All files are zipped for you to make it a very easy transfer using Microsoft OneDrive. We have several telescopes you can choose from, and they are all the same rate. The 10-inch F/8 GSO RC using a AP 0.67 reducer to make it a focal length of 1400mm. The CCD camera is the QSI 583 WSG that uses AstroDon LRGB series iI filters and a Hydrogen Alpha 3nm filter. This telescope is located at 7000 feet 7 miles north of Cortez Colorado. The field of view is 44x33 arc minutes at 0.79''/pixel. The C11 inch Hyperstar system is at F/2 which gives it about 540mm FL. The CCD camera is the Atik 490 EX One shot color camera. There is a Lodestar guider as well so exposures up to 5 minutes can easily be done. 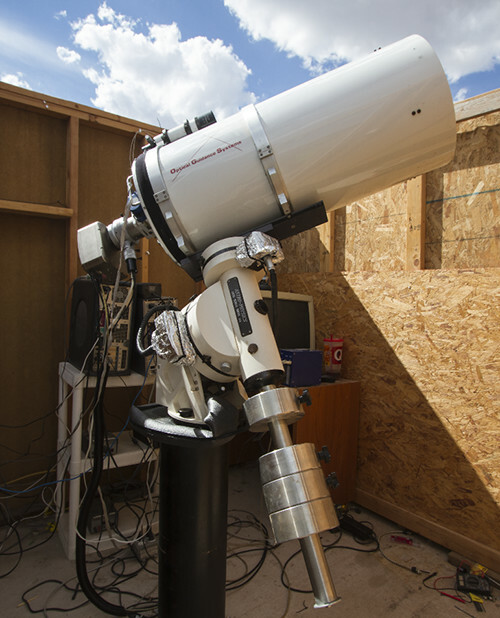 This telescope is on site and has a field of view of 77x64 arc minutes at 1.36''/pixel.